Premium loaders available for the utility Farmall® 90C up through Maxxum® , Puma® and Magnum™ tractors. Compatible with select utility Farmall® C and utility Farmall U tractors. Compatible with utility Farmall® U, Farmall® 100A and most Maxxum® tractors. Compatible with Magnum™ 180 -240 tractors. Compatible with Magnum™ 250-380 tractors. 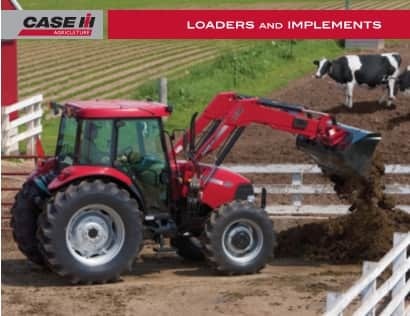 ​Case IH Maxxum® Series tractors combine efficient power with operator convenience to handle the large workload and multiple tasks of livestock operations, row-crop applications and roadside mowing. ​The Puma series is an efficient, multipurpose tractor line designed with just the right size and power to handle a variety of tasks in your operation. ​Built to fit the way you farm. The Case IH Magnum™ Series tractors are the ultimate mix of industry-leading horsepower and fuel efficiency. Available in wheel or track configurations with a horsepower range from 180 to 380. ​Configure and price your new L705 Series Loader. Customize it the way you want.